My name's Lauren McKee, and I regularly teach yoga down at the Paremata Boat Club. When I first began doing yoga, I started to experience some joint pain. I thought, "This can't be right"... "Yoga is supposed to make you feel better, not worse"... "Maybe I'm not doing these poses right?" So, I registered for a yoga teacher training (not originally intending to become a teacher). But, I really wanted to get on top of this 'yoga thing'. Since becoming a teacher, one thing I've noticed is lots of people struggling with their practice - many don't get the full benefits of yoga, such as improved flexibility, strength, and calm. The problem is almost always a lack of awareness of how to do the fundamentals properly. That's why I put this workshop together, because it's such a good way to improve your practice... for a relatively low investment of money, time, and energy. The Yoga Fundamentals Workshops kick-off on Tuesday the 20th of February. Each lesson layers upon the one before it, so you really understand how all pieces work together. You won't be overwhelmed by lots of jargon and difficult to remember poses. This is a very practical workshop. You will use this material immediately in your regular practice. During the 6-week workshop period - choose a regular yoga class, each week, to practice your new knowledge... for FREE. Each class is worth $15, at casual rate. So, the total value of the 6 bonus classes, is $90. I’ve being able to apply some of the muscle activation techniques to other activities (such as gym and running), to improve stability and range of movement. I’ve realised just how important - and how nurturing - it is, to take a step back from our busy lives and just treat ourselves to a few precious, quiet moments each day. I enjoy the clear, easy to follow instructions, options to increase (or decrease) the challenge of poses, and feeling of complete relaxation afterwards... oh, and the view is amazing, too! Each workshop session followed a logical progression, culminating in a class which 'connected the dots', putting everything we'd learned to use.Thanks again, Lauren... for your time, energy, and patience! Because of the workshop, I am now more conscious of my posture and realise how important it is to do the exercise correctly. My flexibility is slowly getting better. I have realised that even though I suffer with arthritis, over time there is no limit to where my flexibility can be. I enjoy... the individual attention of ensuring exercises are done correctly and the feeling of being so relaxed at the end. I definitely recommend this workshop - everybody needs to keep flexible as they age and this is the gentlest way of doing it. I love the fact that every exercise has options so you don’t feel bad if you can’t do it in a specific way. To be fair, I wouldn't have come along unless my wife had wanted to go. I was curious, but not enough to overcome my inertia and fear of the unknown. I’ve experienced a reduction in joint pain, and slight improvement in flexibility. I enjoy the view from the boat club, lying down at the end, and getting out of the house in the evening. Lauren is a good teacher, and doesn't make you feel out of place or stupid - even being the only bloke in the class, I felt quite at ease. I was feeling inadequate, and not able to keep up. But now, I have gained confidence in knowing that it’s not as difficult as I had imagined. Already, I feel slightly more flexible, and encouraged that this will increase, the more I do. I’m learning how to relax and breath, and I enjoy meeting others at the same level. The fundamentals workshops give a good insight to what yoga is all about. Initially, I doubted my ability. However, through the workshop, I experienced greater flexibility, better breathing and calmness. I’m now more grounded. I enjoyed the detailed advice on technique. I recommend this, to get balance back in your life. I’ve experienced much more basic flexibility, which is helping me in daily life. I’m seeing a difference in how my body can work with some yoga. I enjoy the relaxation, when you have been testing limits. The teaching was well paced and always positive. Nice views added to the setting. I’ve enjoyed doing poses, my body is comfortable doing (rather than moves it’s not comfortable doing)!I liked slowly learning the poses. The group dynamic is great - there’s always people who ask questions, you didn't think to ask. I love the boat club, with it’s serene view. Lauren says things, which encourage & support me to think it's a journey. The Fundamentals Workshop is great for beginners, especially if you really want to learn the positions rather than just copying your neighbour (if you can't see your teacher in regular classes). I’m looking forward to continuing classes. Thank you so much Lauren. My posture and breathing has improved. The workshop was perfect for a beginner like me - the way you build the moves up in stages and explain what I should be feeling... being able to ask questions and learn alternative options, if things get a bit tricky! I enjoyed the relaxed,friendly atmosphere… feeling at peace at the end of the session… testing myself to try and do moves. I’ve experienced better breathing, flexibility, mental calmness, and general well being. I thoroughly enjoyed learning to do yoga... the surroundings, meeting people, and developing better awareness of my body and it’s capabilities. Lauren takes you through moves with a calm, precise, and consistent flow that makes it relaxing, yet challenging to both mind and body. She takes time to check you are doing moves correctly and gives options when it is too difficult. I think Lauren is fantastic and hope to be able to continue learning from her. Having never done yoga before, it’s been great learning something new. Both the body and brain have been challenged. That can only be a good thing! I gained basic knowledge of asanas that I can take to classes.I don’t think I would have had the courage to just turn up to a class without the doing the workshop first. The instructor is lovely, friendly, and welcoming. I gained a new awareness of my body, improved flexibility and strength, and rediscovered underused muscles. I definitely recommend this workshop. I love how it’s suitable for all ages and levels of fitness and a real come-as-you-are ‘feel’ to the workshop & classes. Very friendly and encouraging. The workshops are held at the Paremata Boating Club - 110 Paremata Road. There’s plenty of parking in the car park at Ivey Bay (across the road from Paremata Kindergarten). 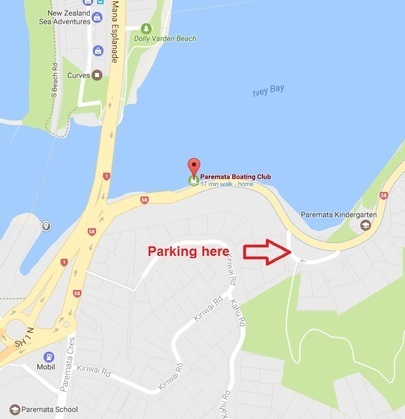 To avoid busy traffic, take the tunnel under the road and, from there, it’s just a 1 minute walk to the Paremata Boat Club. We have also some spare props that you can use. But, if you don’t bring your own, please let me know in advance, so I can arrange for enough to be available. No. I have a list of registrations.